Russia’s Federation Council has passed a statement calling upon world politicians to prevent attempts to rewrite history and blame the Soviet Union for the start of WWII. The Federation Council denounces such statements and calls upon the state officials and public activists to prevent the desecration of the memory of the millions of people who fell victim to Nazi criminals and their accomplices. The Russian senators also urge all foreign authorities to actively bring to justice anyone who publicly denies Holocaust or other recognized genocides. Copies of the statement were forwarded to various international bodies, including the Council of Europe, OSCE and parliamentary assemblies of the CIS and CSTO blocs. A separate copy was sent to the Polish Senate due to that country’s Foreign Minister Grzegorz Schetyna’s recent statement thatthe liberation of Auschwitz was achieved by Ukrainians (the official interpreted the name of the Red Army unit – the 1st Ukrainian Front - as an indication its ethnic composition, when in fact it relates to where it was formed). On the same day the upper house passed a separate statement on the situation in Ukraine in which it expressed deep concern over the recent escalation of violence in the southeast of that country. “Ukraine’s violation of the ceasefire regime leads to mass casualties among civilian population. This includes the tragedy that took place on January 13 near Volnovakha, the monstrous attacks on Donetsk on January 22 and on Mariupol on January 24 that killed and wounded dozens of people,” the document reads. 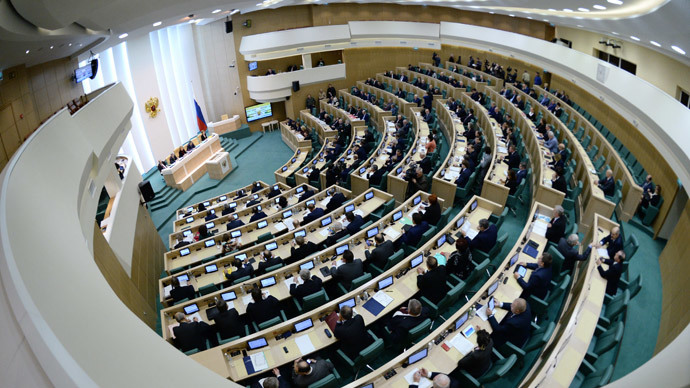 The Federation Council demanded an immediate end to the missile and artillery raids on cities and villages in southeastern Ukraine and an independent international probe into all incidents and crimes committed during the conflict. The chamber also called upon legislative assemblies in Ukraine and the self-proclaimed Republics of Donetsk and Lugansk, as well as PACE and the OSCE, to speak up in support of a peaceful settlement of the conflict.